August 16, 2017 By Chelsey 10 Comments This post may contain affiliate links. Read my disclosure policy here. I am excited to introduce another Quiet Book for your cute little kiddos. This book helps twith teaching hand-eye coordination, color to word recognition, sorting, fruit and vegetable names, measuring, matching food to shadows, and puzzles. It is a really fun book. We have loved having it around my house. I have even caught my older kids playing with it. “But it’s so cute, Mom!”, my 10-year-old said. You know it’s a good one if everyone wants to play with it. DONUTS : Mach Each Colored Donut to its Color Name! Look at those little faces. Makes you want to run over to the Bakery and buy a yummy treat. When we find the match we break down each color name. While holding the red donut, we point to the letters R-E-D, Red. It is really effective. My four-year old can spell several of the smaller color words. FOOD PUZZLE: Put it together matching the fruits up with the pieces. My son used to struggle with puzzles. We focused a lot on color matching and completing each individual image. It was hard for him to see the big picture but he loves puzzles now! FRUITS AND VEGETABLES: Put the Fruits and Vegetables into their crates. Make individual crates and put the food in the correct crate. Good luck with that tricky tomato. I still tell my kids it is a vegetable. MEASURE THE FRUITS: Measure each fruit from bottom to top and put by their number of inches. The stems are included in the measuring. That is why I made a bottom and a top for measuring. Use the ruler on the page and measure the fruit and place it next to the correct number of inches. LEMONADE: Add the lemons and Ice to the Lemonade. You have to add the essentials to a pitcher of lemonade. When we play with this page I often give specific instruction. Place a piece of ice next to________. or place the ice at the top and the lemons at the bottom. Anything to help them learn beyond the quick placement of the pieces. Isn’t this the cutest!? This is my favorite page. Place the tomatoes and lettuce in the taco with the other ingredients. Then close up the tasty meal and smile, because the taco is smiling back! FAMOUS PAIRS: What two things go together? These couples are almost as famous and Romeo and Juliet. We have Bacon and Eggs, Burger and fries, Milk and cookie, Donut and Hot Cocoa. The kids match the food to its shadow. Notice the love between them ♥. PIZZA: Put together the Pizza Puzzle. You can be as picky as you want on this. You can use all the pepperoni or just be happy that the pizza actually resembles a circle shape. My son matches it up correctly with all the pepperoni about half the time. So you could just let them put them on where they want at first just to get the shape and then increase the difficulty later on as they get quicker at the puzzle to give them more of a challenge. When making all the pages, I recommend printing all the pages and pieces on cardstock and laminating them with 5ml laminating sheet. I use this machine. It is fantastic. I hope you like what you see. I get this adorable quiet book and others GO HERE! Do YOU have other favorite Quiet Books?! I phurchase this today and I got charged twice is there any way you can give me my money back. I just seen the money was refunded thank you . Hello…just discovered your page, what program you use to create them? how do I get the taco on the page??? I recently purchased all the quiet books. Love them!! But I am unsure of how to assemble the taco page! How to you attach the taco? Any suggestions or tips?? I am also wondering how to attach the taco and fruit and vegetable crates? Do you just tape them on after laminating everything? I just purchased the 7 set of these and am also wondering how to assemble the taco page and the fruit crate page. I love your sets but wish they had come with some instructions, at least for the pages that require a little more than just inserting into a laminating sheet. Are there instructions that I have missed noticing? First off I added a sheet of plain white paper to the backs of each page and used the idea of putting an envelope on the back sides to hold the activity page pieces. Just laminate as usual and take your exacto knife to cut along the flap of the envelope and add a velcro dot to hold the flap shut. I added decorate washi tape along the edges of the flap and the bottom so they wouldn’t start peeling and also because the laminated plastic can get kind of sharp for little hands when they’re getting the pieces out. But just plain clear tape folded over the edges would work too. 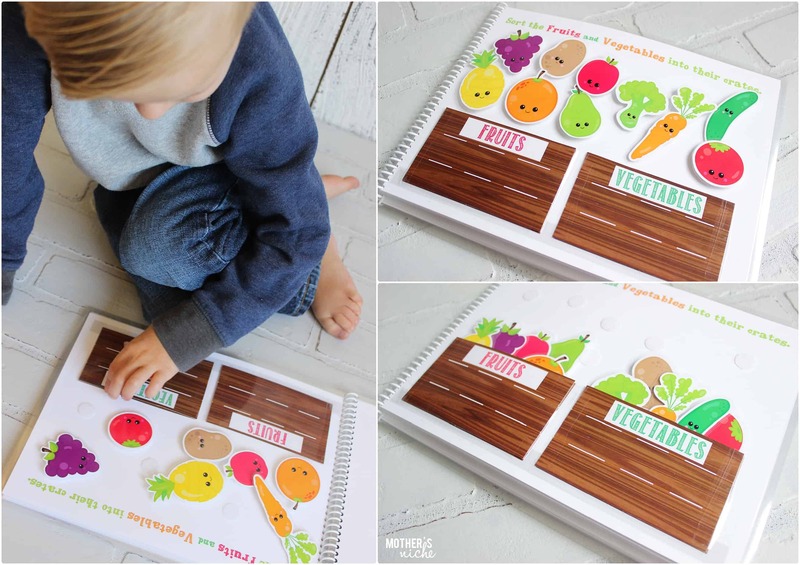 Fruit & Vegetable page: Before laminating, I cut out the extra crate pieces that have the label “fruits” and “vegetables” on them and then I used double sided craft tape to tape the sides and bottoms to the crate pictures on the activity page. I laminated the page and then used an exacto knife to slit the plastic right above the top crate piece. (helps to use a ruler and a dry erase marker to draw your cutting line on the plastic — found that out the hard way. 🙂 ) To finish it, I used some decorative washi tape to seal the laminated edge of the bottom crate picture. If you cut your slit line far enough away on the top piece the seal should hold but I didn’t want to risk the bottom piece to start peeling away — plus it just looks better. You could also just use some clear tape. 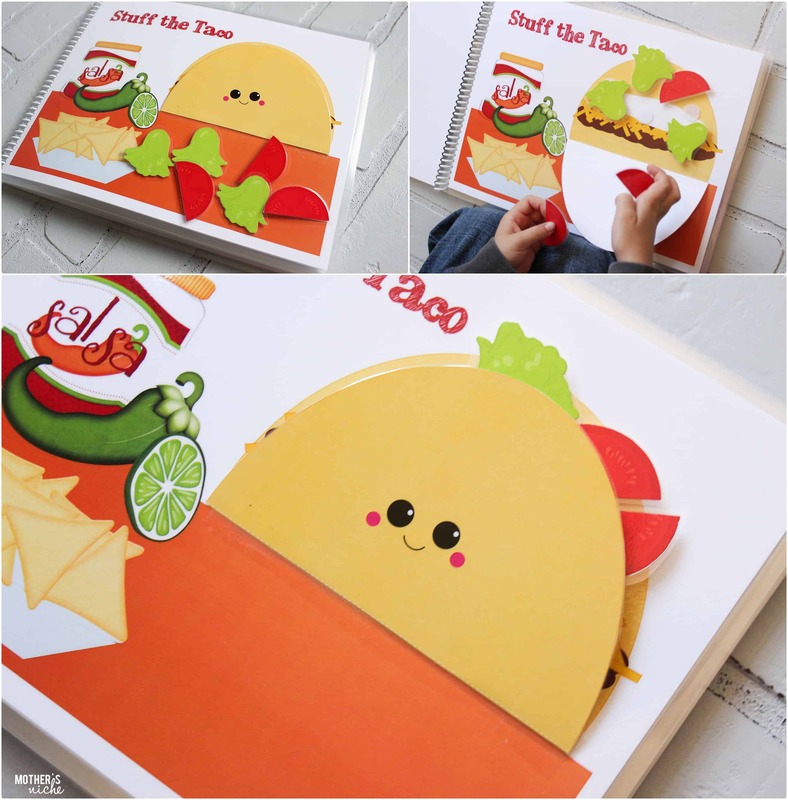 Taco Page: cut out and laminate the extra taco shell piece with the face on it. After it is laminated, you will need to score it along one of the dotted lines (I picked the middle one). I have scoring blade that I can switch to on my paper cutter, but if you don’t have one, I’ve also used the back side of one of the blades on an opened scissor (just don’t cut yourself!). Your goal is to just create a soft line that will allow it to bend straight but not a hard enough line that it will cut into it. Laminate the activity page and cut a slit with your exacto knife along the dotted line. Insert the shell piece inside the slit (it will slide between the two sheets of paper and be hidden from the back side) and I lined up the bottom dotted line with the top of the orange colored section, the middle dotted line is your scored line. I used a piece of clear tape to hold the shell piece to the activity page. I see some of the questions are from last year, but I hope this helps the ones who are still trying to figure it out.